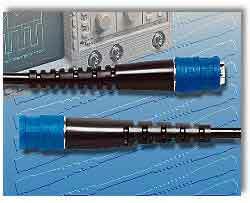 Pomona Electronics253 50-ohm coaxial cable allows secure retention with the convenience of a push-on connector. The Model cable's locking feature assures secure connections even in installations where twisting is severely limited or restricted. It is a RG58C/U, 0.195-in. O.D-type BNC male coaxial cable assembly with insulated push-on connectors at both ends and is rated at 500 VRMS max, +50°C (+122°F) max. Flexible strain reliefs, molded to the cable jacket, restrict bending to prevent impedance changes. Connections are achieved through the use of the company's snap-fit locking feature. The BNC connector features a PTFE insulator for broad temperature range, gold-plated center pin for low contact resistance and nickel-plated body for tarnish resistance. The push-on connectors eliminate the need for twisting, thus extending the product life. , 1500 E. Ninth St., Pomona, CA 91766. Phone: 909-623-3463; Fax: 909-629-3317.